I like to paint from life, which means painting on location or with the thing that’s being painted actually present. Painting from photos just isn’t nearly as satisfying for me because I can’t get as close to my subject as I would like to. You see, not only do I like what happens when paint goes on a surface – the explosion of color and movement of the brush over the canvas or paper and the mixing of colors, I very much enjoy looking at my subject and really, meditating on it. This Peony is stunning and so is the shadow. The scent is also out-of-this-world! If I’m outside I can listen to the sounds around me of birds singing or the sound of the wind rustling leaves or grasses blowing in the wind. I enjoy the smell of the air and the fragrances of the earth and plants. These 12′ tall hollyhocks were so inspiring and called out to be painted. I like to watch shadows flit across a field when clouds move across the sun. I enjoy the many shades of green in the landscape. Painting becomes a truly sensual experience. 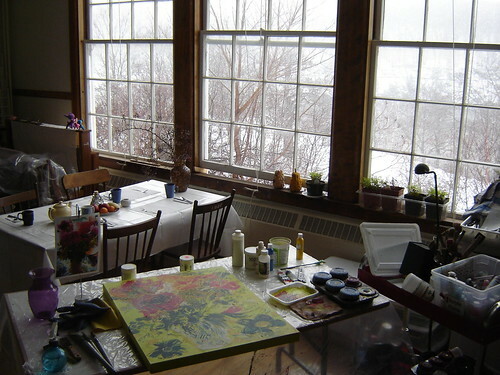 The painting is 3 feet high and was started on location and finished in the studio. If I can’t go outside because of cold weather or rain, I can still set up a still life and paint indoors. In that case I am often examining flowers close-up and checking out the petals and the shapes of the blooms. When I lived in the city it was possible to buy fresh flowers, even in the winter, for a very low price. Unfortunately, that is no longer the case for me here in Bear River. Fresh flowers are very expensive and the choices are quite limited. Last summer I had a flower subscription with Cheryl Stone of Bear River Blooms. Every week Cheryl would deliver a fabulous bouquet to the studio complete with vase. Cheryl grows the flowers herself and will cut for you a totally custom-made bouquet. Cheryl would call me in advance to find out what my colour choices were and ask what type of flower I preferred. Talk about being pampered! I wasn’t able to paint all the beautiful bouquets she delivered but I did take photos and now I am printing some of them out to use as inspiration for my new paintings. It’s certainly not like working from the original bouquet but because I staged the photos in the first place with a painterly composition in mind, it’s the next best thing. This was one of my favorite bouquets last summer. I love peonies, in part, because they remind me of my dear mother and my grandmother – two wonderful, clever and witty women who passed on their love of flowers and of gardening to me. What I also like about this photo are the colours. The contrast of the lime green in the lupines with the dark pink of the peony are very appealing. Red and green are complementary colors which I like to use in my paintings. I decided to use that pale lime green as the ground or the background for the canvas. Here is a video of my first approach to painting this bouquet. It morphed quite a bit until I felt OK with the results. When I work on a new painting, I do so as long as it gives me pleasure. If I start feeling like I don’t know where to go next or I feel a sense of frustration, I stop. It is possible to look at the same piece of work on different days and feel different levels of satisfaction with it. Sometimes the only way to know the next step with a painting is to put it away and to work on something else. This week I returned to the painting and was so excited about working on it, that I thought of different ways to express “peony” and started 2 more paintings! I’m very happy with the painting. I like the textures and the colours and the feel of it. However, the real thrill was in the making of it and now that it’s over, I can’t wait to move on to the next. 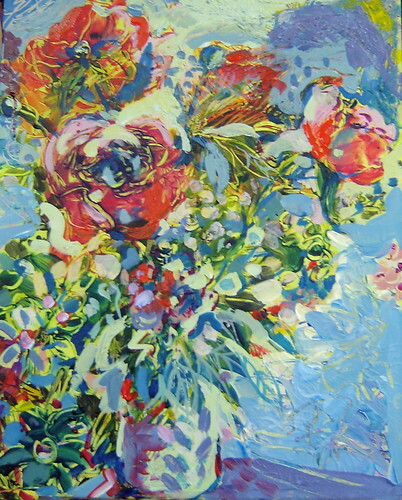 This painting, inspired by Cheryl’s flowers has inspired more paintings from me. And inspired is a wonderful state to be in. < Inspiration. Where does it come from? That video is a mini-workshop. Flora. And your advice about stopping when a painting starts to frustrate you is excellent. Our work deserves our best attention and positive energy, doesn't it? After all, that energy is being absorbed into the painting and will continue to radiate out to viewers. So, it behooves us to consider the type of energy we are saturating any given work with. It's true! It's also a good reason to work on multiple pieces at once. There is nothing so exciting as starting a new piece, but it is also great to be on a roll and pull out an unfinished piece and look at it with fresh eyes and know what to do!Thanks for writing Carol!